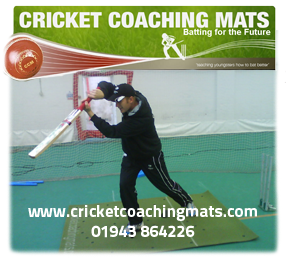 The Coaching Mat is designed to give youngsters the time and opportunity to improve their batting, bowling and fielding skills on a perfect surface and in a fun way. If you have ever found that wayward bowling restricts the progress of many a young batsman? Bowlers find it hard to put the ball consistently in the right areas to enable the batsman to consistently practice their shots and for you to coach them as effectively as you might. To overcome these difficulties, the Coaching Mat provides a simple, effective batting space together with a set of flexible tees (5 different heights in all) on which to practice all the shots. These can range from front foot cover drives, on drives and sweeps to back foot square cuts, pulls and drives (plus the full range of defensive strokes). A set of 6 footprints are provided and these are used to get the feet into the correct positions for both batting and bowling. The tees are placed from beneath the mat into one of 39 carefully positioned holes. This means that they always stay in place so saving you a massive amount of time and trouble. The youngster can then play each shot over 100 times in just a 10 minute period thereby “grooving” their memory muscles. They will then be equipped to hammer the bowling to all 4 corners of the ground, scoring more runs than you ever thought they were capable of and winning matches and league titles for your club. A constant supply chain of future first team players is now established. From a parent’s point of view, you will probably be keen to see your child develop quickly and perhaps move up the batting order, score that first 50 or century and make the District or County age group team? The Coaching Mats are also designed to be used by youngsters to practice their shots at home. They can be set up in the garden or driveway and by watching the 16 coaching clips on their laptops or smart phones can learn to bat even better and go on to play those match winning innings. Success Stories & Testimonials !